No to the former (listen to me), yes to the latter (doing something different). The Z6 and Z7 aren't likely to get a Mark II version or significant hardware iteration for two years. Sony will iterate the A7R to Mark IV before Nikon updates their cameras. A A7S Mark III is also likely from Sony and could up the feature/performance game. Nikon doesn't have feature parity with Sony yet, probably because the Z6 and Z7 were a bit rushed to get out. Sony's full frame sales were starting to eat into Nikon's, and the rumors of the R from Canon (and maybe even the S from Panasonic) almost certainly got to Nikon HQ. Thus, there are bits that don't feel finished on the Z series, and lot of what was done with the excellent D850 firmware base Nikon started with was in the way of simplification. Thus, to finish up the initial offerings and to keep the Z marketing messages active, Nikon was always going to have do some significant firmware updates. 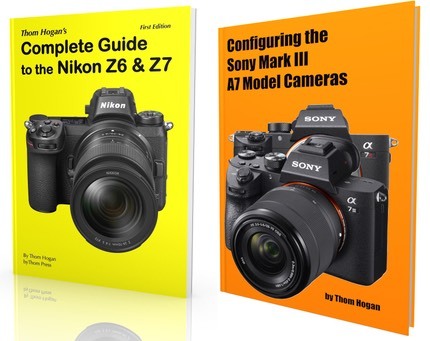 I suggested a number of update suggestions in my Z7 review, but I keep finding more as I work through all the nuances while writing my book on the Z6 and Z7. The Z's really feel like they were premature births by about a month or two. Surprisingly, I'm not finding as many firmware bugs as I usually do with first Nikon releases. I chalk that up the fact that they were working from a good D850 base and simplifying most of the time. The Z6 and Z7 are really just missing some small features, shortcuts, and performance tweaks. The Help system is missing a bunch of entries, too. Nikon knows they need to make the Z's "right." They did a really good job of that out of the box, but no complex product ever quite ships as originally intended these days; there's always something you left off or didn't manage before the lock date hit you. I suppose it is possible that Nikon might roll with an "S" type update as they used to do many years ago (e.g. D70 to D70s, or even further back, N90 to N90s). But I'd expect any such change to be really small on the hardware side, and mostly firmware adjustments, so these could easily be rolled to the existing cameras, as well. Still, I consider an update any time in the next two years highly unlikely. Of course, Nikon could choose to lengthen their DSLR cycles while pushing mirrorless, but that's risky considering that DSLRs are still far outselling mirrorless and Nikon has no crop-sensor mirrorless products to point the DX users at, which is another project that must be moving forward within Nikon, too. There's a limit to what they can do hardware-design wise in a short period.